4,518,184 unique applications. From four different data sources. 74.71GB. All in Stata. Now I just have to figure out what it all means. And I have two weeks to do it. It has been a rough week of coding, processing, and de-bugging. But at long last, tonight I’m running the last two scripts I need to run to parse the last of the 330+ Gigabytes of data I received three weeks ago, and I’ve already tested them so I’m pretty confident they’ll work. By tomorrow, if all goes as planned, I’ll have all the data I’m going to be using on this project (a lean 60 GB or so) imported into Stata, where I can slice and dice it however I please. At exactly the halfway point of my residency in Tokyo, this is a major milestone. The next step is some finer-grained cleaning and de-duplicating of this data, followed by some additional coding to structure it in a useful way (as you can see in the photo, I’ve already started sketching out my file trees). Then I’ll be able to describe and analyze what I’ve built. All of this will take time–the most primitive observation identifier in my data is the individual trademark application number, and it looks like I’ll be dealing with about 4.5 million of them, give or take. And each application number will have multiple records associated with it to capture lots of nitty-gritty trademark-y information like changing ownership and legal representation, renewals, divisional applications, goods and services classifications, foreign and international priority claims, and so on. Processing all that information takes time, and requires a lot of attention to detail. But today I’m feeling good. Today, I feel as confident as I ever have that this project is going to succeed. 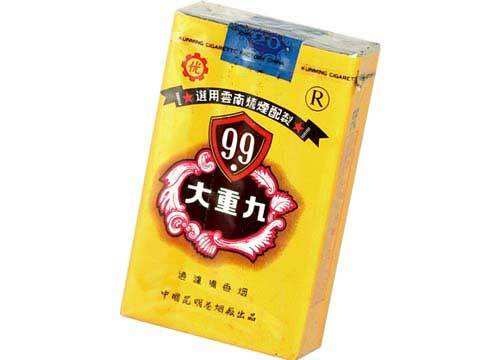 重九 translates roughly to “double-nine”, and the additional character (which apparently always accompanies the mark in its current use) translates roughly to “big” (i.e., “Big Double-Nine” Cigarettes). The mark was last renewed in Japan on March 28, 2015. Given that I’m here to study international aspects of intellectual property as they pertain to Japan, the fact that the earliest mark on record appears to be foreign is an interesting development. At some point in 2014, without any warning so far as I can tell, the Japan Patent Office changed the file-naming convention for their digital archives. Whereas before the archives would be stored under a filename such as “T2014-20(01-01)20150114.ISO”, hereafter they will be stored under a file name such as “T2014-21(01_01)20150121.ISO”. I’ve been trying for about three days to figure out why one of the scripts I was given to parse all this government data has been failing when I try to run it. Because the researchers who gave me the scripts commissioned them from some outside programmers, they can’t help me debug it. So I’ve been going line-by-line through the code and cross-referencing every command, option, and character with online manuals and forums. My best guess is that my problem is (probably) once again a failure of translation. The code I’ve been given was written for LINUX, a (relatively) open UNIX platform. Mac OSX–which I use–is also built on top of a UNIX architecture, which power users can access via the built-in Terminal application. But Apple uses an idiosyncratic and somewhat dated version of the UNIX shell scripting language–this is the computer language you can use to tell the computer to do stuff with the files stored on it. (“Think different” indeed.) There are tons of tiny differences between Apple’s shell language and the open standard implemented in LINUX, and any one of them could be responsible for causing my code to fail. I spent the better part of two days tweaking individual characters, options, and commands in this script, to no avail. Then I tried a patch to update Apple’s scripting language to more closely mirror the one used by LINUX. Still no luck. And three days of my precious seven-week residency in Tokyo gone. So I gave up. I’ll write my own code instead. The script I’ve been trying to debug is one of a series of algorithms used to collate and deduplicate several years’ worth of parsed data. But I can create those kinds of algorithms myself, once I know how the parsed data is structured. The hard part was parsing the data in the first place to extract it from its arcane government archive format–and the scripts that do that worked a treat, once I figured out how they function. Besides which, the deduplication strategy used by the researchers who gave me these troublesome scripts is a bit more heavy-handed than I’d use if I were starting from scratch. Which I just did–in Stata, the statistical software package I’ll use to analyze the data, which uses a native scripting language I’m much more familiar with. This new script seems to be working; now I just need a good solid stretch of time to allow my home-brewed code to process the several gigabytes of data I’m feeding it. Unfortunately, time is in short supply–I’m in week 3 of my 7-week stay, and I’m supposed to present my findings to my hosts during my last week here. So from here on out, days are for coding and nights are for processing.